Are you looking for a way to give your students daily reading comprehension practice that requires no prep? This packet of 20 short passages will allow your students to practice reading fluency and comprehension every day. Each page has a short story with an illustration and 5 comprehension questions (2 multiple choice and 3 short answer). These are lighthearted, fiction passages with a March theme. 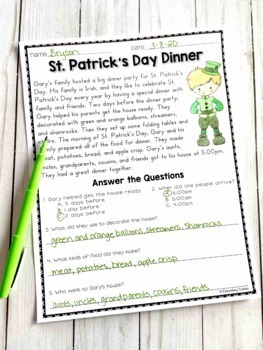 Most passages are about St. Patrick's Day activities. There are a few other March topics, including baseball championships and first day of spring. They are appropriate for advanced first grade, second grade, and third graders needing extra practice. This product is also available in a YEAR LONG BUNDLE for $12.50 off the total price. Click the link below to purchase the bundle instead. 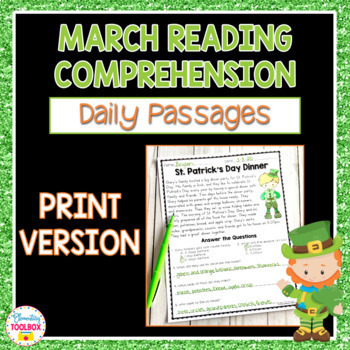 To see each month of reading comprehension passages listed individually, click the links below. You might like these other resources. Be the first the know about new products, sales, and giveaways! Click on the green star next to my logo, and you're set!